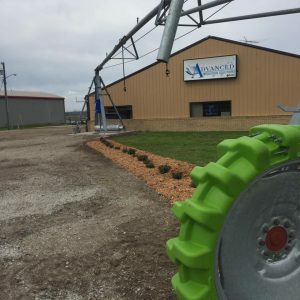 Here at Advanced Irrigation Solutions we are Reinke Irrigation dealer owned and operated by Tyler Mensik, just outside the city limits of Fremont, Nebraska. We specialize in sales, parts and service of Reinke Irrigation Systems, but also offer retro pivot options, parts and maintenance on all competitive irrigation brands. Tyler Mensik started Advanced Irrigation in 2010 with the same dedication to quality work and drive to make a respected name in the agricultural community as he strives for today. In recent news, we have become an MFS/Stormor grain storage systems dealer as well. It has been some years since the article below was run but, we are still grateful for opportunities both Reinke, MFS/Stormor, and our customers have afforded us over the years. • The Morse Bluff native is the youngest dealer in Reinke history. Just over a year ago, representatives from Reinke Manufacturing pulled into Victor’s Inc. in Fremont. The pivot manufacturer based in Deshler, Nebraska, wanted to talk to the Morse Bluff native Tyler Mensik about opening a Reinke dealership in Fremont. Mensik had been working at Victor’s Zimmatic dealership since graduating from North Bend Central in 2005, but the opportunity to run his own business overcame his loyalty to the Zimmatic brand of pivots. On April 1, 2010, Mensik became the youngest dealer in Reinke’s history by a good 10 years. Mensik, now 24, said his first year in business wasn’t without its challenges. Reinke was new to the area, so most local farmers had no experience with the company. However, many farmers who had worked with Mensik at the Zimmatic dealership followed him to Reinke, he said, and others were attracted by the low price of Reinke systems. In some ways his young age helped him. With his Reinke dealership opening in April, he had already missed the prime pivot selling and building season, and the wet summer didn’t help business much, either. However, year one proved to be a success. When the Reinke higher-ups asked last April to estimate his first year sales, Mensik told them he would be very happy if he sold five to eight pivots. He ended up selling three times that many. Mensik graduated from Norflok’s Northeast Community College in 2008 with degrees in irrigation technology and agronomy. That, plus his experience working for Victor’s Zimmatic for four years, gave him the confidence to strike out on his own. However, such risks are always involve a little stress. With himself, one other employee and a secretary, Mensik’s company, Advanced Irrigation Solutions, serves a good chunk of eastern Nebraska. The company sells, builds, services, moves and updates pivots. Mensik’s hours have been “crazy” during the first year, but he admits some of that is his own fault. When it comes times to build a pivot, Mensik relies on his North Bend-Morse Bluff roots to fill his crews, hiring several college-age NBC graduates to help erect the pivots. He said he can build a whole system in eight hours with a crew of five or six guys. Mensik and his wife of eight months, Courtney, live where he grew up southwest of Morse Bluff. Another perk of being the boss, he said, is allowing himself some time off to help his father Dan on the family farm. Someday, when Advanced Irrigation Systems has more employees, he would like to be more involved with the farm. Until then, his focus is on growing his business and building the Reinke brand in this area. Courtney Mensik says her husband is off to a good start after one year. As for other young businessmen who would like to follow Tyler Mensik’s lead, he would encourage them to grab opportunity when it comes knocking.